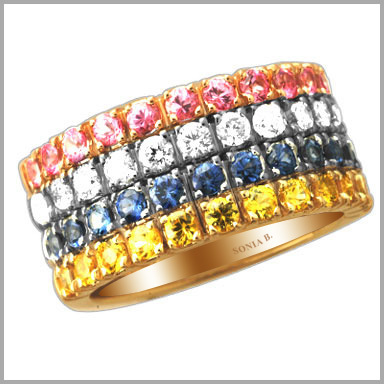 14K Tri-Color Gold 0.4800ct diamonds and 1.860ct Multi-Color sapphires Ring. This four row diamond ring is crafted in polished 14K white, rose, and yellow gold. It features 12 round full cut diamonds in prong settings, 12 pink,12 blue and 12 yellow sapphires in prongs settings. They glisten intently as they complement the setting color. If you're looking to stand out with a distinctive style, this ring is for you. The total diamond weight is approximately 0.4800ct with a color of G-H and a clarity of SI.The sapphires weight is approximately 1.8600 ct The setting size is 3/8"W x 13/16"L with a height of 1/16".